Home Events News Smartphones Xiaomi Xiaomi Mi 8 Arrives in PH; Price Starts at Php25,990! Xiaomi Mi 8 Arrives in PH; Price Starts at Php25,990! 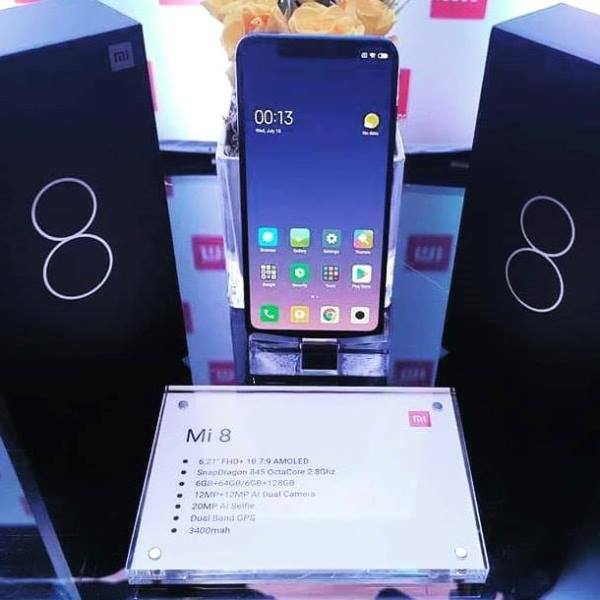 Alongside with the Redmi 6A and Redmi 6, Xiaomi has also launched its flagship smartphone in the Philippines – the Mi 8. In case you missed it, the Mi 8 is housed in a metal and glass body. It flashes a 6.21-inch AMOLED screen that delivers 18.7:9 screen aspect ratio and 88.5% screen-to-body ratio. Under the hood, it is powered by Snapdragon 845 octa-core processor coupled with Adreno 630 GPU. It also comes with either 6GB/64GB or 6GB/128GB RAM and ROM configurations. Meanwhile, both models are non-expandable. Jumping off its camera department, it is equipped with an AI-assisted 12-megapixel f/1.8 + 12-megapixel f/2.4 rear sensors, and 20-megapixel f/2.0 selfie snapper. It boasts 3400mAh battery to accompany users on their mobile tasks, too. The phone is running on Android Oreo with MIUI 9.5 skin. The Xiaomi Mi 8 will be available beginning July 30 at authorized Mi Stores in the Philippines. Its 6GB/64GB variant costs Php25,990, while the 6GB/128GB model is priced at Php27,990.